Salento boasts a glorious and most ancient tradition in handicraft: ceramics and terracotta that date back to the third millennium B.C. 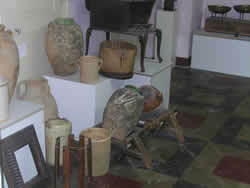 Just think about all the finds that date back to the prehistoric age and that people the museums in Salento. In particular, pots have a very ancient tradition because of “cucco”, a small jug with a single handle used to pour water. The water was taken by the women who went to the fountains and filled an “orcio“, a larger vessel made of terracotta, with two handles, so that it could be lifted and put on the head. Other types of pots, all bigger than cucco, where “fiasca” , a flask covered with wicker with a single handle, “minzani” a vessel used for oil, “capase“, a glazed vessel used to preserve foods, “pignate“, pans used to cook legumes, “trimmuni” and “limmo” a small vessel that still has a domestic use. The working of terracotta is not restricted to the production of domestic objects, but also to games such as whistles, small bells and “pupi” that still enliven our creches. S. Pietro in Lama, Lecce, Cutrofiano, Ruffano and Lucugnano are well known for their flourishing production of terracotta. PapermachA� production comes typically from Lecce. Also the origin of this ancient trade dates back to some centuries ago. It is said that it was born in the a�?600, in the back of the shop of some barbers. Other people say that it was invented by more modest people who enjoyed themselves in shaping straw and rags covering them with paper, making in such a way the famous statues and holy figures that are present still today in many churches of Salento. The stone from Salento dates back to the second half of the nineteenth-century. Already at that time it was unanimously ascribed to the Miocene, a time during the tertiary period which lasted from 23 to 17 millions of years ago. Today the working techniques of the past have been replaced by modern machinery that allows making works done with the stone from Lecce in less time. However on the land there are still handicraftsmen that work using the stone-cutter. Due to its composition, the stone from Lecce obtained the function of suitable material for decorations. It is also due to its presence that today people can admire several Baroque works, such as the church of Santa Croce in Lecce. Today besides marshy reeds weaving, common cane-brake weaving or wicker weaving it is possible to find sticks and young suckers. Handmade techniques tend to praise the quality of the final work and to fight against the quality of the industrial production without the fear of losing. The current production is limited to the area of Acquarica del Capo. Reeds working exist in the province of Lecce from time immemorial. Reeds weaving were born in the production of hampers and baskets to pick up fruit or for ricotta or junket. However there are also weaving works done with sticks and olive branches. In almost all communes in the South of Salento there are spinners and weavers that work with the traditional loom of Salento. It is a treadle loom with a very ancient origin. It has a rectangular shape and it is made of olive wood. Also embroideries and lace are one of the highest prides of the expert tradeswomen of Salento. This tradition was handed down from mother to daughter. In each village of the province there is at least an embroideress and lace-maker who is able to decorate a highly valuable trousseau. The most known lace is the “chiacchierino“, which is done with a spool on the fingers, and also the “tombolo“, which is done with the famous art of weaving the treads around other treads that are pinned up on a drawing fixed on a big cylindrical and stuffed pillow. While you can find plenty my gathering of language schools, not all of them are as effective, so you need to know what to look for when you search for the right school.